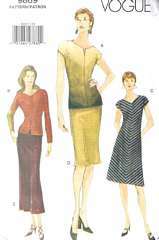 Fitted, A-line, bias dress, above mid-knee or top (in two lengths) has cap or long sleeves. A: front neck slit. B: front hemline slits. Fitted, bias skirt , straight or A-line, in below mid-knee or above ankle length, has waistband and back zipper. Uncut and complete. Copyright 1998.